On September 18, 2018, I was diagnosed with Rheumatoid Arthritis. This was after several weeks of debilitating pain in my hands, wrists, and shoulders. I was fortunate to have an excellent team of physicians who, with therapy and medications, have given me my life back. I have learned from this wonderful foundation (Arthritis Foundation) that people with arthritis are warriors boldly facing the pain, limitations and challenges the disease causes. Challenges like getting properly diagnosed, multiple doctor’s visits and treatments, a maze of insurance procedures, missing school or work, being unable to perform normal, everyday tasks or enjoy favorite hobbies and activities. I am facing these challenges and do not plan to give up my active lifestyle any time soon. This year on September (2019), my wife Tammy and I, will be bicycling from San Francisco to L.A. in an effort to raise money for the Arthritis Foundation. 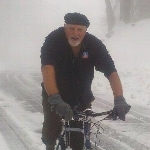 I ride to cure arthritis to improve the lives of arthritis warriors. This incredible event is the largest gathering of the arthritis community in the world, raising funds for resources and research, to find better treatments and a cure. Please donate to help me reach my fundraising goal and help the Arthritis Foundation conquer arthritis once and for all.